SIMSOLID is a next-gen structural analysis solution intended primarily for design engineers. It is a powerful software that eliminates the two most expertize-centric, time-consuming, and error-prone tasks of customary finite element analysis (FEA) namely geometry simplification and meshing. The program’s computational engine applies innovative extensions to the theory of external approximations to analyze CAD geometry effortlessly, without meshing. The application scrutinizes large assemblies and complex parts, only theoretical with traditional FEA. The crux of this analysis is the way SIMSOLID accomplishes it more efficiently on any desktop-class computer. Additionally, the software utilizes distinctive multi-pass adaptive analysis to govern the accuracy of the solution. SIMSOLID is really fast and is created for users looking to prepare models in minutes. SIMSOLID pioneers new techniques that integrate directly on the fully-featured CAD assemblies without meshing. The solution is designed to enable design engineers to work within their design processes and analyze CAD geometry quickly and efficiently without simplification or modification. It eliminates the arduous “CAD mesh” steps that demand multiple judgment calls, are error-prone, labor-extensive, and appeal for seasoned professionals in CAD and simulation. One of the biggest SIMSOLID advantages is its analysis breadth. The software leverages unique technology that delivers a radical analysis suite without the myriads of tolerances and settings of traditional FEA applications. It substitutes manual meshing for adaptive analysis whereas geometric & material nonlinear analysis is performed without configuration. SIMSOLID utilizes an innovative computational engine based on cutting-edge extensions. In addition, it doesn’t utilizes the point-wise DOF, popular with the traditional FEA. Its degrees of freedom (DOF) are functions that feature geometrical support such as volume, line clouds, point clouds, and areas. This makes it easy to handle assembly contact and geometrical imperfections like ragged contact areas, penetrations, and gaps. The application applies a fast and efficient methodology. It utilizes the multi-pass adaptive analysis to control the solution accuracy. Better still, SIMSOLID allows design engineers to define adaptivity on a partly local or entirely global basis. This triggers superior performance metrics for analysis time and memory digital footprint. It enables users to solve large and complex assemblies quickly on their desktop. 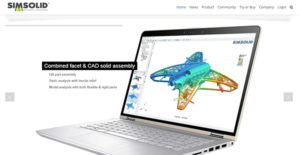 If you are interested in SIMSOLID it could also be beneficial to investigate other subcategories of Best CAD Software collected in our base of B2B software reviews. Every company has its own characteristics, and may need a specific CAD Software solution that will be adjusted to their business size, type of clients and staff and even particular industry they cater to. You should not count on locating an ideal software that will be suitable for each business regardless of their history is. It may be a good idea to read a few SIMSOLID reviews first and even then you should keep in mind what the software is intended to do for your business and your workers. Do you need an easy and intuitive solution with only elementary features? Will you actually use the advanced functionalities required by pros and large enterprises? Are there any specific features that are especially beneficial for the industry you operate in? If you ask yourself these questions it will be much easier to get a solid solution that will fit your budget. How Much Does SIMSOLID Cost? We realize that when you make a decision to buy CAD Software it’s important not only to see how experts evaluate it in their reviews, but also to find out if the real people and companies that buy it are actually satisfied with the product. That’s why we’ve created our behavior-based Customer Satisfaction Algorithm™ that gathers customer reviews, comments and SIMSOLID reviews across a wide range of social media sites. The data is then presented in an easy to digest form showing how many people had positive and negative experience with SIMSOLID. With that information at hand you should be equipped to make an informed buying decision that you won’t regret. What are SIMSOLID pricing details? What integrations are available for SIMSOLID? If you need more information about SIMSOLID or you simply have a question let us know what you need and we’ll forward your request directly to the vendor.